In 1807, an English ship was wrecked off the coast of Maryland and the survivors included two puppies, a red male named Sailor and a black female named Canton. The puppies were of the St John's Newfoundland breed that was used to help fishermen retrieve their nets. The local waterfowl hunters used these pups and their offspring soon became known for their courage and prowess in the icy cold waters of the Chesapeake Bay. The original pups were crossed with other breeds in this area, including water spaniels, curly and flat- coated retrievers, pointers, setters and coonhounds. Always the selection of breeding stock was based entirely on superior working ability. The strength and endurance of the Chesapeake Bay Retriever, with its incredible courage, enabled these dogs to make long swims and to retrieve more than 200 ducks or geese in a single day. The breed gained the reputation of a peerless water-retrieving dog in snow, ice and heavy seas as cold water does not bother them. The Chesapeake Bay Retriever can live up to 12 years of age, but will soon reach 14 years if fed correctly and given a loving environment in which to thrive. A healthy male should weigh 36kg and be 66cm tall while the female should be 25kg and 54cm in height. The Chesapeake Bay Retriever is a multi-purpose dog, a marvellous companion and an individualist that possesses independence and loyalty with a certain aloofness. The Chesapeake is a one-family dog with a very strong protective nature for what belongs to them or their adopted family. The breed has a strong affinity for children and is very protective of them. They are regarded as an intelligent breed with a bright and happy disposition. As a retriever, they have a remarkable memory for multiple retrieves and very good marking ability. The memory is very apparent when Chesapeakes are used for other activities such as obedience as they are very easy to train. Once a Chesapeake Bay Retriever becomes a member of a family, the dog accepts all members of that family whether they are human or animal. A well-socialised pup will readily accept any other pets as part of its kingdom, but it does tend to want to be ‘top dog’. The Chesapeake Bay Retriever is a low maintenance breed. A brushing once a week is more than adequate to keep the coat clean, but this is not required if the dog can swim at least once a week. 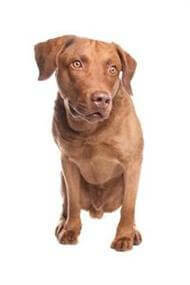 In full coat, the Chessie should not be bathed with soap or detergent as this will remove the natural protective oil. This oil renders the dog almost waterproof, incidence of grass or flea allergies, hot spots or other skin problems rarely occur in this breed. Adults do not require a lot of exercise, but it is important for growing pups. With their great love of water, Chessies should be able to swim as often as possible. The strong protective nature of this breed for its family can be mistaken for aggressiveness and as such it is important to socialise the pup with other animals and people at an early age, particularly male pups. Once a Chesapeake Bay Retriever understands the ground rules, there is unlikely to be any future problems but it is important to teach these ground rules at an early age as an adult Chessie is a big and powerful dog. The breed has two inherited genetic diseases, Hip Dysplasia and Progressive Retinal Atrophy, which can result in blindness. Any person that can ensure that the Chesapeake Bay Retriever will be able to share their life and has the ability to train and control a dog. Ideally the person would lead an active outdoor life and be able to reciprocate the love and affection that will surely come. The breed makes a great children's pet and will play for hours.